SCD Group: Does Your Association Member Recruitment Program Include Thank You? Does Your Association Member Recruitment Program Include Thank You? I officially joined the golf club Wednesday afternoon. While on the driving range Thursday morning, the golf pro came up to me and thanked me for joining. A golf club is much like an association: members paying dues. Most associations have aggressive membership recruitment programs. But, it stops when the member pays his/her dues. In reality, it should not end until after that all important thank you and welcome. Does your association have a “thank you and welcome” plan beyond sending a “new member packet?” If not, why not? Ask your CEO and senior staff to call randomly selected new members. Ask your Board members to volunteer to call and welcome new members. Remember, your member renewal process begins (or should being) the moment I pay my dues. Don’t wait to engage new members until next year’s dues renewal notice. Call, email, mail or in some way thank me for joining and remind me why it was a smart move. Call, email, mail or otherwise remind me again in two or three months. Ask me if I’m benefitting from my membership. Perhaps do this via a survey. Remind me why I joined again at six months. And, don’t forget to provide a “new member ribbon” at your annual meeting. Then, when you ask me to renew, remind me of the benefits available to me over the last year. Please note: write these as benefits NOT features. So, be sure you’ve thanked a member today! 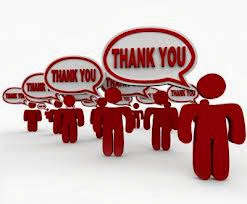 Feel free to share your member thank you strategies by commenting on this post at www.scdgroup.net.